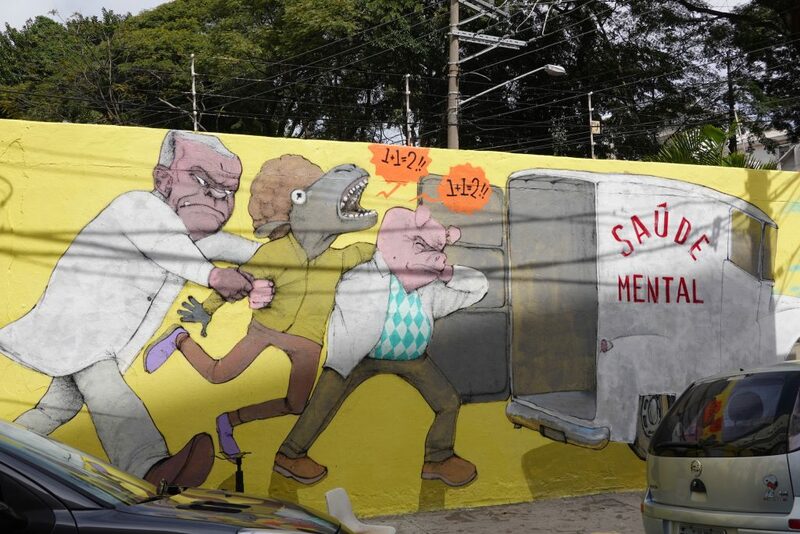 Street Art of South America is famous for its beauty and, often, political statements or social movements. 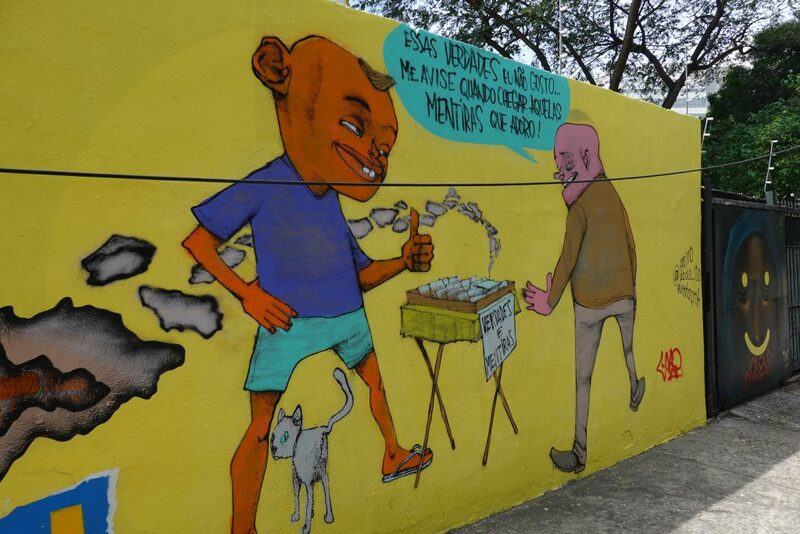 From Valpo (Valparaiso, Chile) to Colombia to Brazil, street art turns grey concrete into vibrant color and comment. What could be more fun than an outdoor art museum? 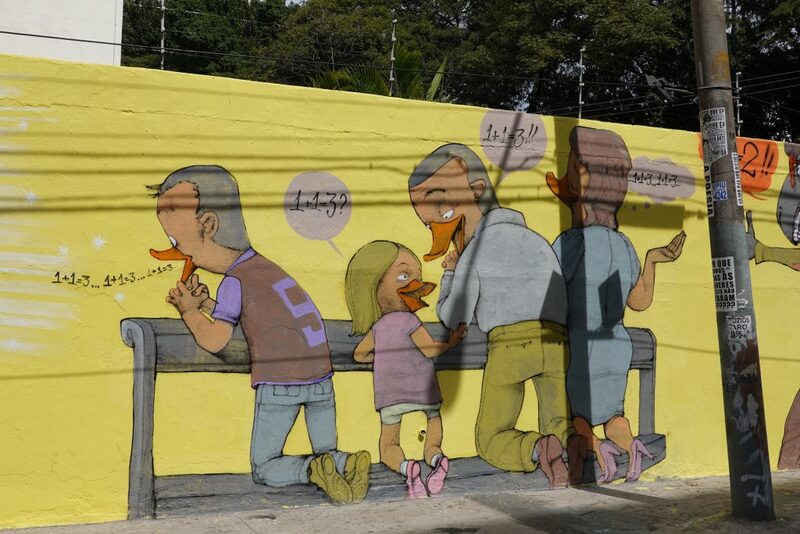 Companies commission street artists to express their creativity on walls. This prevents “taggers” from defacing the walls surrounding the company’s headquarters or offices. Our guide, Renato Goes, (www.aroundsp.com), was beyond great. He knew the history, the art areas, and the artists. We never felt rushed, and from beginning to end, enjoyed the camaraderie. BTW, his English is excellent. 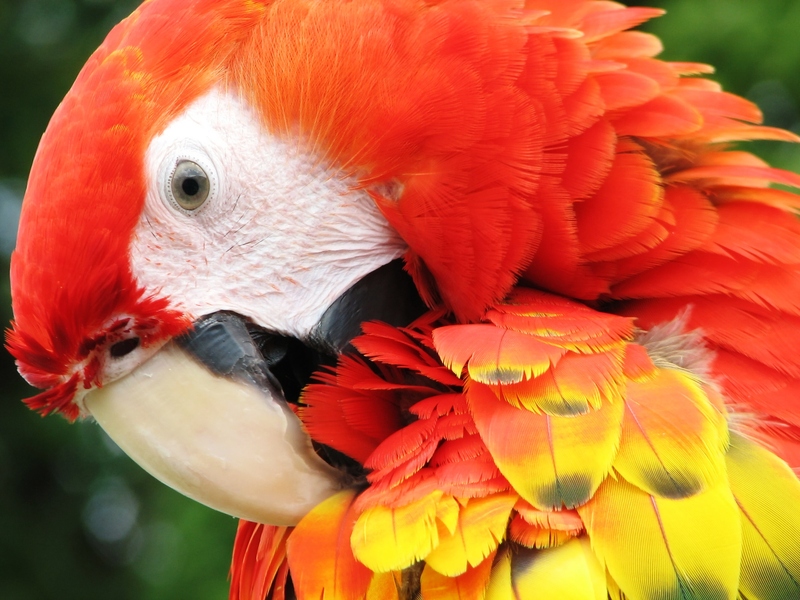 We began our adventure in Jacano, which, in the 19th century, was the city limit of Sao Paulo. 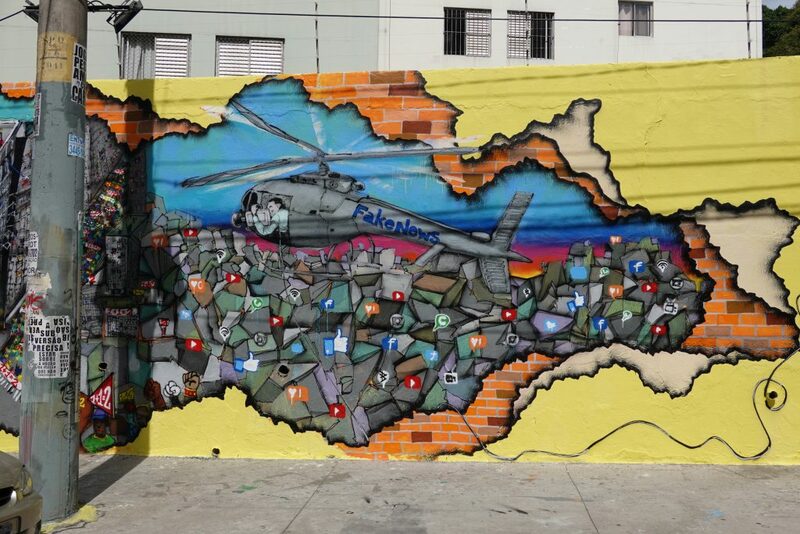 Many of the artists are commissioned by companies and communities to paint on open spaces. 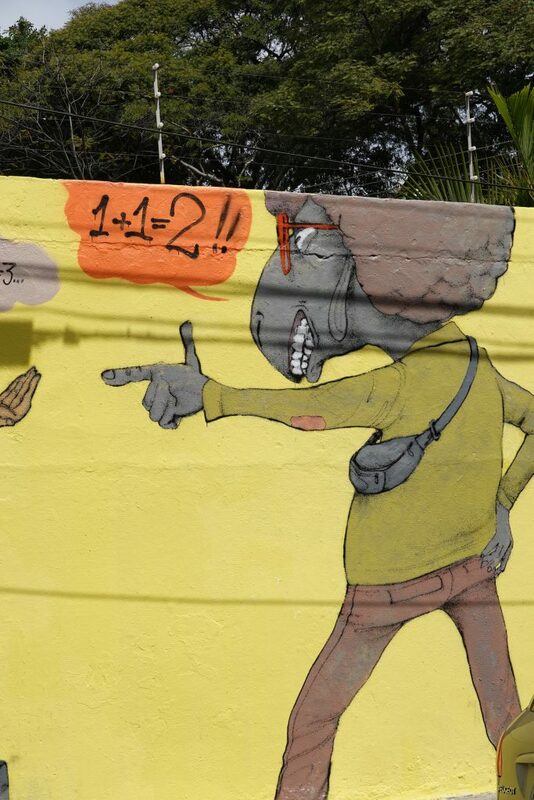 A tagger’s code of conduct is to never deface an artist’s work. There is a difference in street art and tagging. Initials or the name of a gang is tagging (pixo). 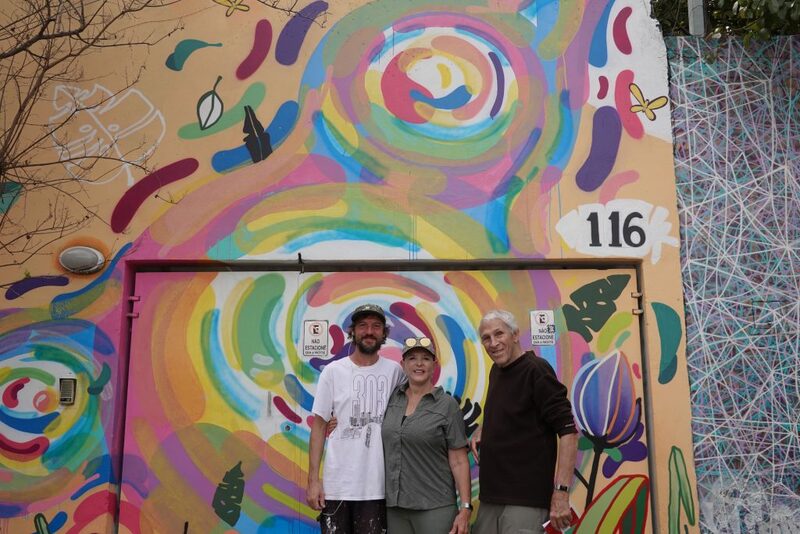 One of the great mural artists, Eduardo Kobra, explained: “Street art in Sao Paulo is a postcard for Sao Paulo.” Respect by the art community. 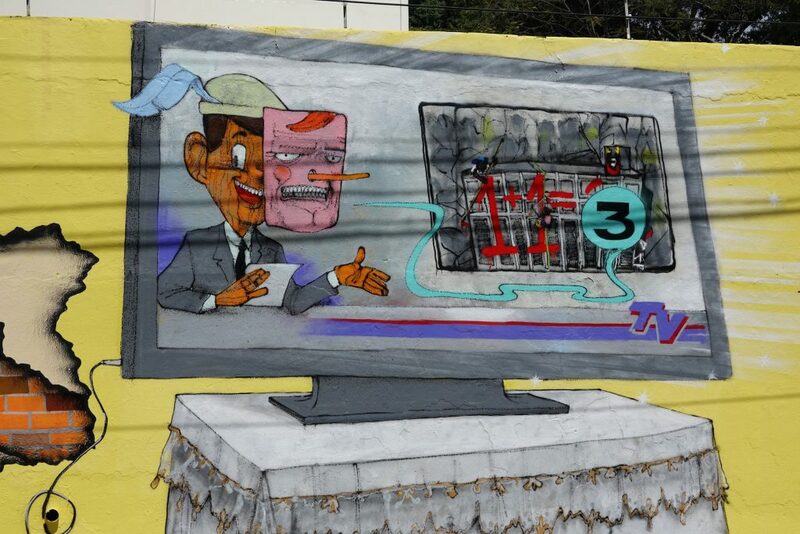 One of my favorite political statements is the Souls for Auction mural. Unfortunately, the small tree is obscuring the politician who has a siphon where he is harvesting the people’s souls and collecting them in a jar. 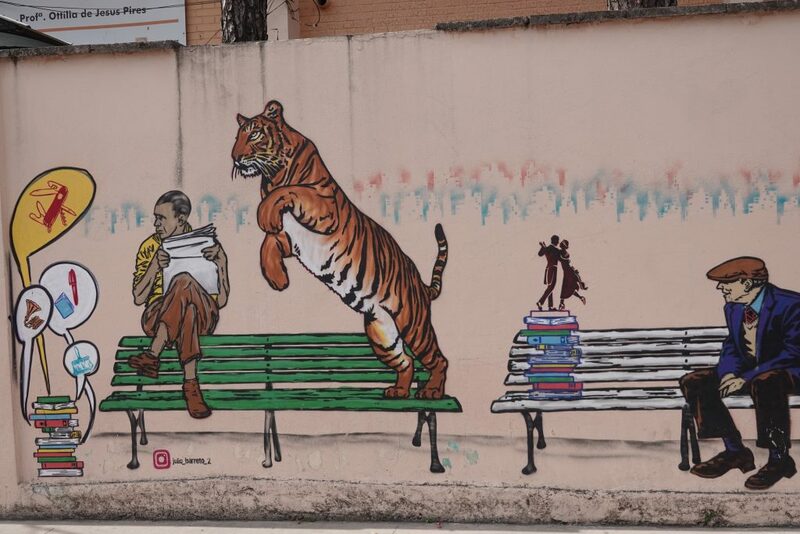 This artist, Julio Barreto, uses the tiger in many of his pieces. The stacks of books are key to Barreto’s work. 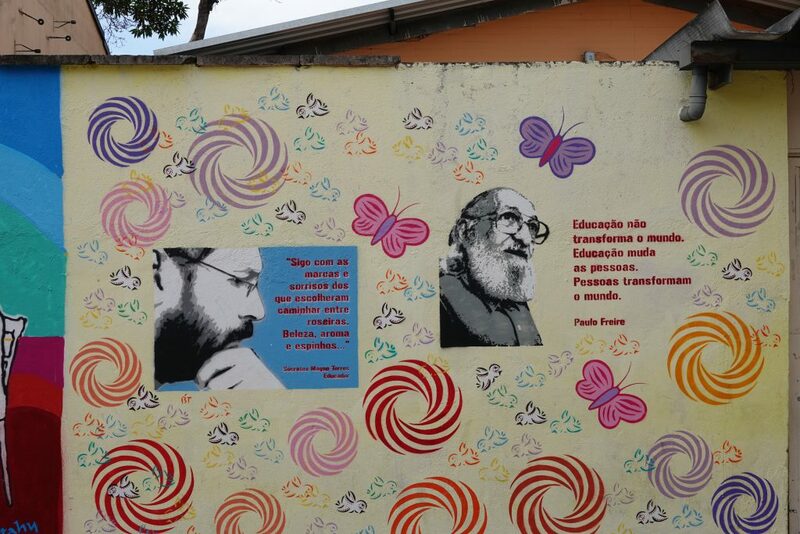 Just to the right of this work is a saying: Education does not transform the world. Education transforms people. People transform the world. Education doesn’t transform the world. Education transforms people. People transform the world. Vermelho combines stencils, color, and paint to express his ideas. 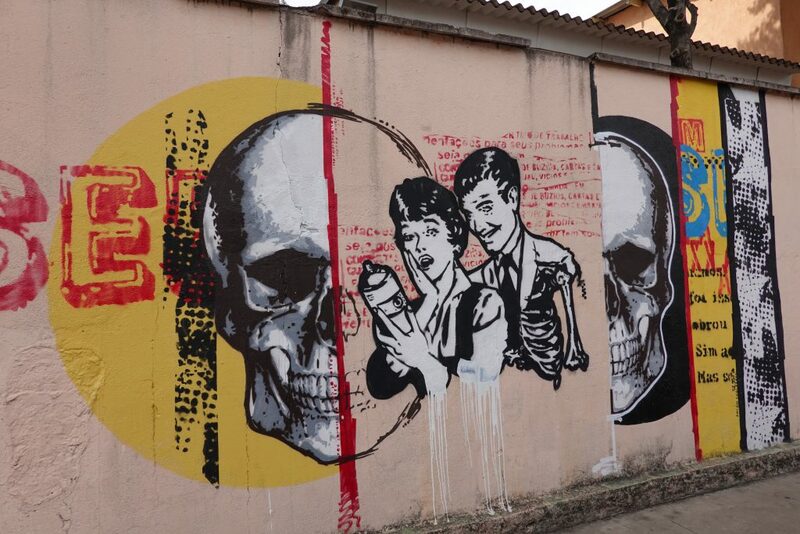 Vermelho can be identified by his frequent use of skulls and stencils. Notice the man’s left side has been eaten away from a product the women is surprised that it obviously contains carcinogens. The young guy is selling truth and lies. The Fake News helicopter is passing “news” to all the social media companies. The news commentator is two-faced and is advocating the 1+1=3 “truth”. The family is repeating the new mantra, 1+1=3, as they are in a reverent pose. The “government” comes to take the donkey away to the mental hospital indicating that he is crazy. The government wants to silence the truth. The government silences the “truth”. Lies are easier than truths. This is such a potent way to express current political ideas. Our next stop was the MAAU (Open Air Street Art Museum) which contains 70 murals for 2 miles (3 kilometers) beneath the metro train tracks. Homeless people are often camped in front of the art, but walking around, viewing the art doesn’t seem to bother either the visitors or the homeless people. One of the most tender murals: mother and child. Beautiful, soft, subdued colors used in this piece. Notice the vertical bricks in front of the mural. This is prevent the homeless from camping in front of the piece and possibly damaging the work. 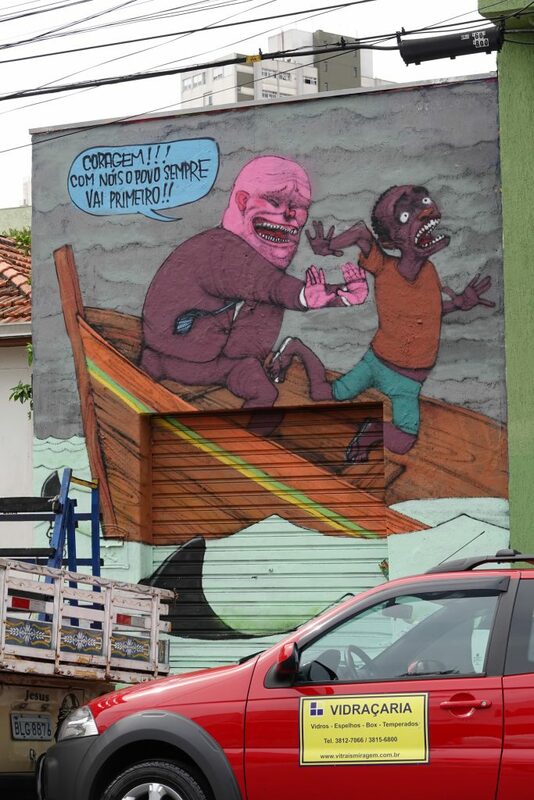 What an interesting statement on this mural. 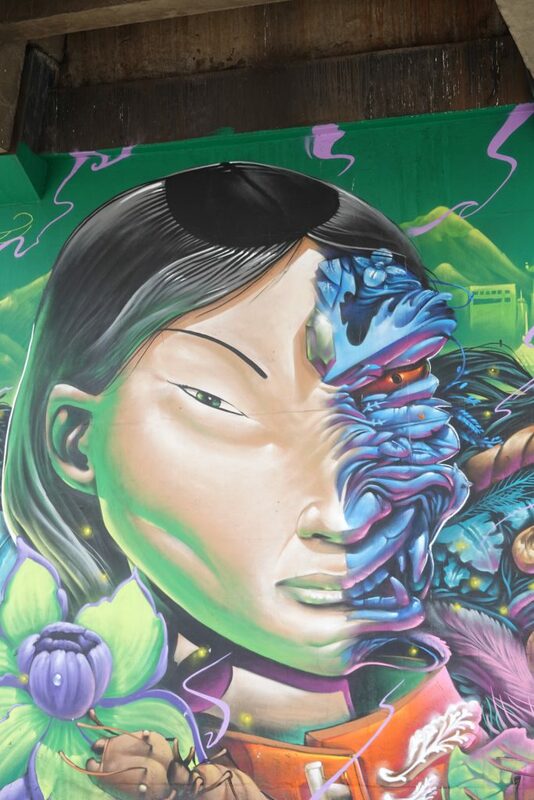 There is a large Asian population in Sao Paulo and this image appears to have Asian features. Vibrant colors used in this piece. A beautiful person on the outside, but a monster on the inside. Two artists, a man and women, Chivitz and Minhau. Minhau usually paints cats. 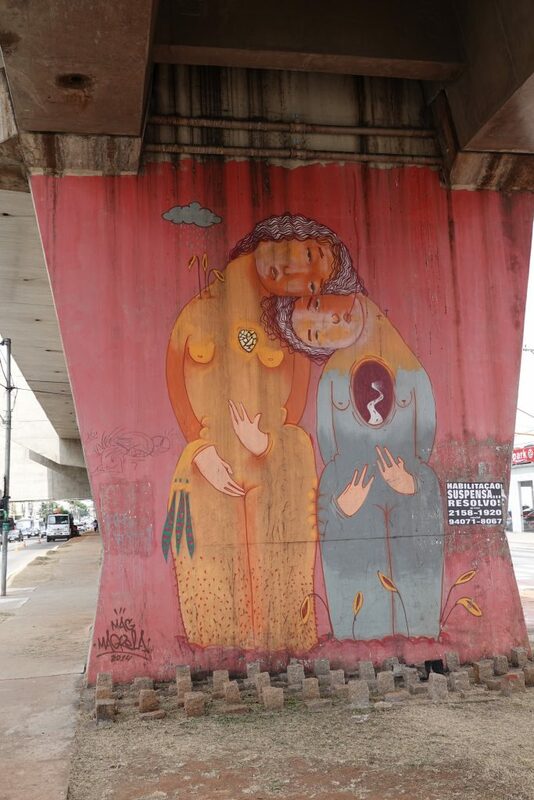 For a long time, street art was male dominated, but now, more women are doing street art. 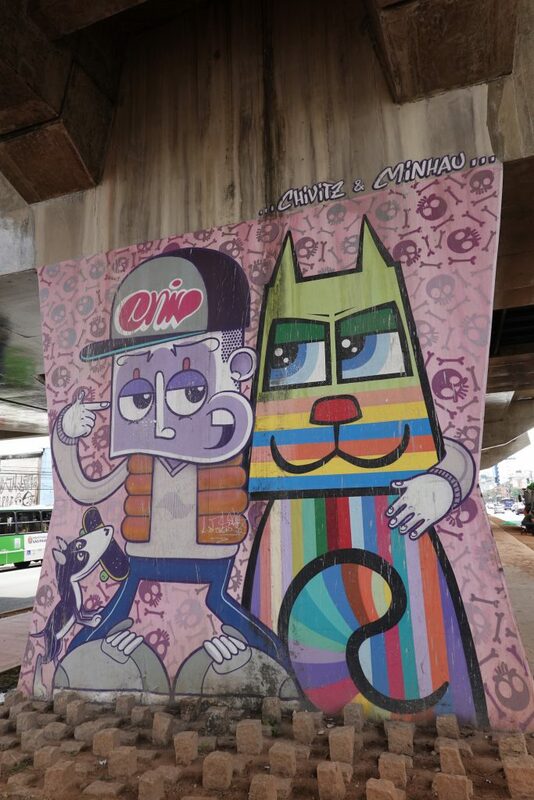 Minhau has quiet a few pieces around Sao Paulo. College students transformed this neighborhood into a bohemian area. Batman’s Alley was an abandoned alley that artists began painting murals on the walls. 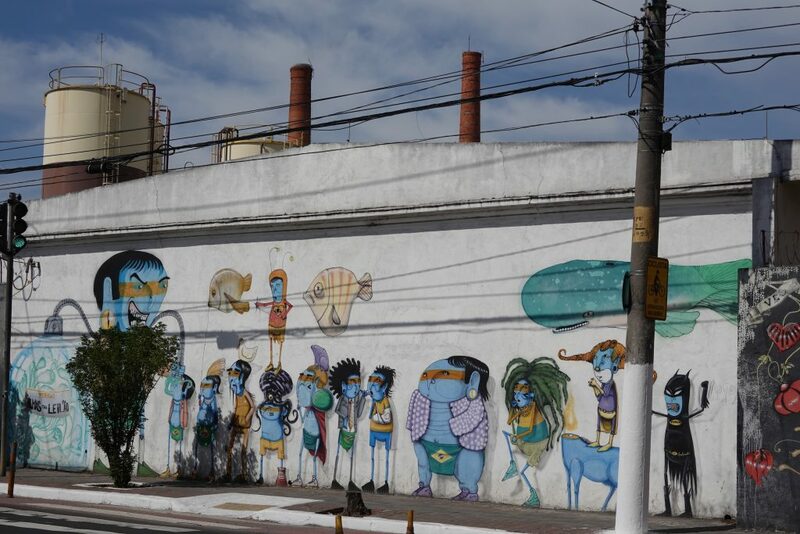 This part of Street Art Tours is popular with visitors. There are great cafes and shops to compliment the wall art. Too bad if you don’t fit into the round hole. We’ll make you fit. Or, make you feel bad if you don’t fit. “We always let you go first.” A political comment on how politicians treat minorities. One of the artists working on his painting was the friend of our guide, Renato. We had the privilege to meet him and take a photo in front of the mural he was painting. Annie and Bruce with the artist. 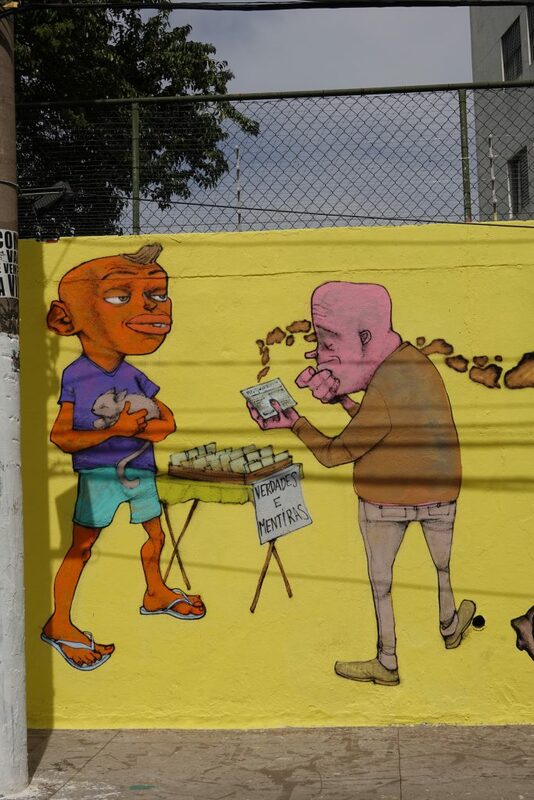 Don’t miss an opportunity to see the street art in Sao Paulo. 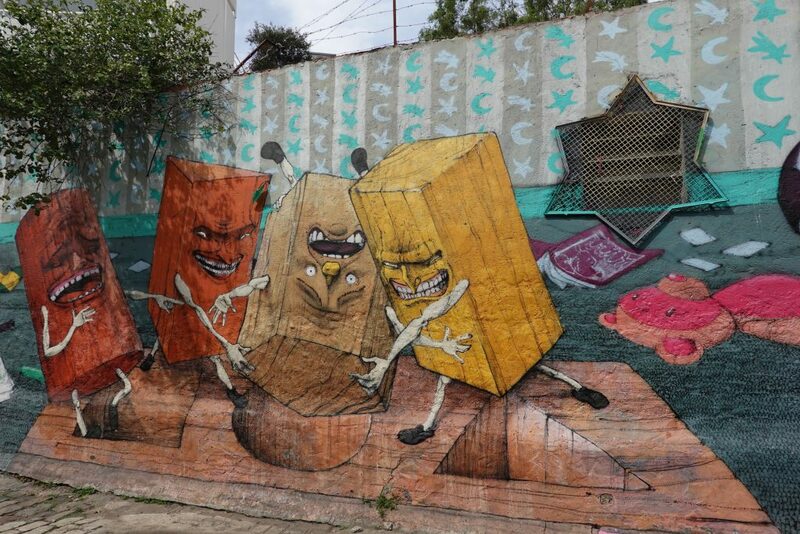 Artists in South America produce outstanding street art. 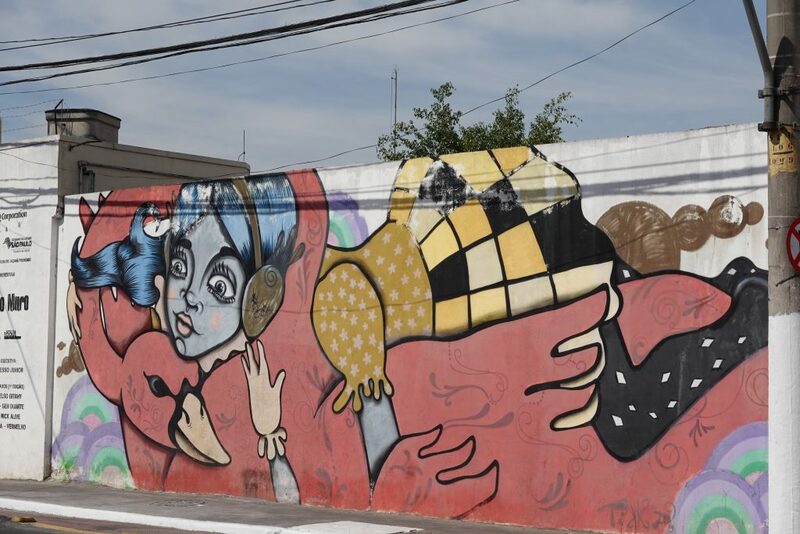 Whether you are in Valpo or Sao Paulo, be sure to take time, have fun, get outside, and see some of the best outdoor art anywhere. 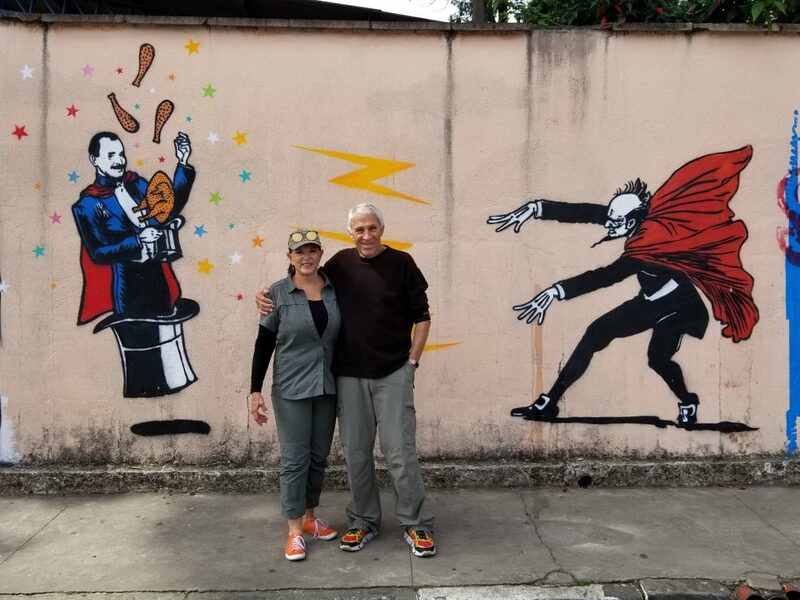 Annie and Bruce in front of Sao Paulo Street Art.